Replacement Projector Lamps – Available Online! 19 Apr Replacement Projector Lamps – Available Online! We have been supplying projector lamps to the Irish market for over 20 years. In that time there has been a vast improvement in replacement projector lamps, specifically in the areas of reliability, lamp life and reduced cost. Years ago, lamp life was typically 1500 hours, these days we regularly offer lamps with 5000+ hours which is great news all round. Projector lamps burn at such high temperatures that you should only use original manufacturers lamps that are designed to operate in this demanding environment. It is illegal and unethical to buy and sell counterfeit projector lamps, yet many well-known and respected distributors are doing just that and in so doing are also compromising the reputation of re-sellers with their customers. The sale of fake projector lamps is on a rapid increase and has infiltrated legitimate markets in every country of the world. Many re-sellers are unwittingly buying and selling fakes without realising it because their reputable supplier has been similarly duped by their supply chain. Remember if the price is too good to be true, then it probably is. 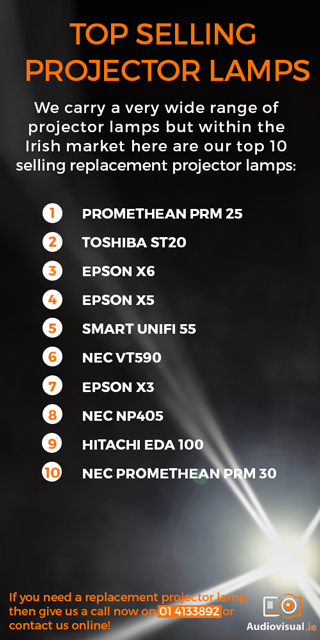 Why Choose An Original Projector Lamp? An original replacement lamp will ensure that your projector operates in line with manufacturer’s guidelines and will not void your warranty by exploding whilst in use. By using a counterfeit lamp you’re rendering your warranty null and void as well as taking unnecessary health and safety risks as counterfeit lamps don’t undergo the same rigorous testing as their official counterparts. Through our sister site we have been providing safe and genuine projector replacement bulbs on www.projectorlamps.ie. Check out our online catalogue to see our stock, price & availability. You can order online and receive next day delivery (subject to payment and stock availability) or call us anytime on +353 1 4133892 for friendly professional advice.